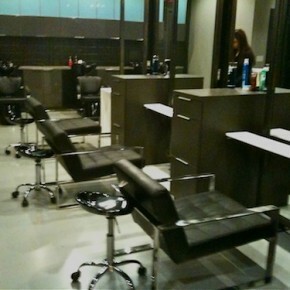 A new salon for men opens in the heart of Chicago’s Financial District. A haircut in the financial district that won't make you cringe: Van Buren Gentleman's Salon stylist Alicia attends to a customer. 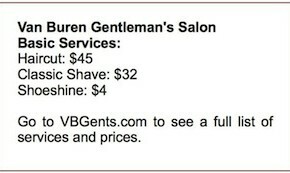 Like many places of business in Chicago’s financial district, haircuts are on the menu at Van Buren Gentleman’s Salon. Unlike, many places in Chicago’s financial district, discussing haircuts at Van Buren Gentleman’s Salon does not induce a flood of expletives or conjure up thoughts of declining securities and unfriendly repo markets. Quite the opposite, actually. A haircut from Van Buren Gentleman’s Salon can actually inspire confidence after a long day of being beaten down by a drastically different type of haircut. 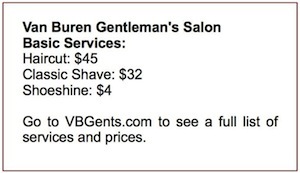 Van Buren Gentleman’s Salon — VB Gents for short — opened in December of 2011, and owner Deanna Goldstein pinpointed the financial district as the place to plant her business because of its dense population of men. While she found a target rich environment, Goldstein didn’t attach her entire business strategy to the salon’s location. One of the first things she did was create a stylish and inviting environment for men that is completely void of bro kitsch. “We definitely wanted to stay away from cheesy sport memorabilia and extras that clients don’t care for, like dart boards, pool tables, etc.,” says Goldstein. VB Gents is located on the first floor of 235 Van Buren, a relatively new condo building in the loop with a jigsaw appearance and designed by Perkins+Will. 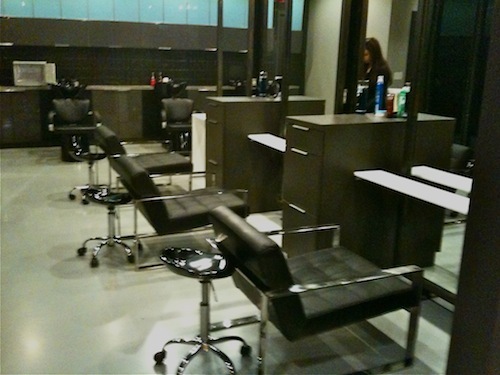 Goldstein describes the salon’s space as having a “raw industrial look,” and the decor features contemporary design staples like dark brown frameless cabinets, glass-front cabinets with aluminum frames, and Zuo Modern’s Carbon Chair. A row of Carbon Chairs inside VB Gents men's salon. Obviously, creating the right atmosphere with decor is important, but a Carbon Chair isn’t going to give you a style-enhancing, confidence-boosting haircut. That’s where Goldstein, a men’s stylist of eight years, and the rest of her experienced staff come in. VB Gents features three stylists, one esthetican, and the one and only Jose Luis, a licensed barber. During a recent trip to VB Gents, we had the pleasure of getting a shave of the highest order from the aforementioned Jose Luis. While we don’t consider ourselves straight-ravor-shave connoisseurs, we do know that our beard is more than a formidable foe for barbers. Before receiving a shave from Jose Luis, our last straight-razor outing left our face bloody and more irritated than Newt Gingrinch answering questions about his ex-wives. The barber who cut up our face called our beard “the toughest” he ever encountered. So when we visited with Jose Luis, we were both nervous and curious to see if he could deal with our beard. He graded out with the highest of marks, leaving our face fresh and smooth, although admitting we had the “second most difficult beard” he’s ever shaved. Needless to say, if Jose Luis can handle our sandpaper facial hair, he should do wonders with yours. Besides shaves and haircuts, VB Gents offers express manicures, regular manicures, waxes, facials, shoe shines, free beverages, pleasant conversation with its lovely staff, and plenty of other hair and salon services. You can even get a membership to the salon, which provides you with, amongst other things, unlimited haircuts. Membership packages start at $550. So far, Goldstein reports that many of VB Gents patrons are professionals and students who ply their trade in the Loop. Of course, that doesn’t mean non-financial district denizens need not apply. If you’re looking for a salon that specializes in people with Y chromosomes, VB Gents might just be your spot. Just remember that once you leave the salon, you might want to keep the “haircut” talk to a minimum. Van Buren Gentleman’s Salon: 235 W. Van Buren St. * The Loop. Open Mon. through Sat., Closed Sun. Check website for hours. You can also read hairstyle tips for Chicago men from VB Gents’ owner, Deanna Goldstein. 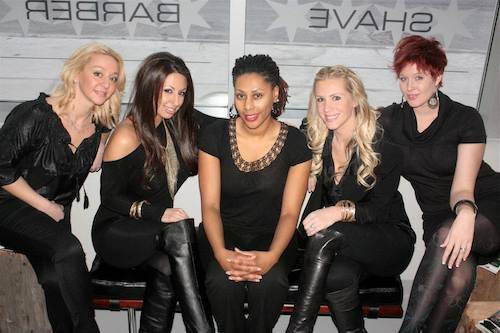 The women of Van Buren Gentleman's Salon, including owner Deanna Goldstein, second from right. Well-written and totally on the money! I live in Printer’s Row and love the convenience, even if I didn’t live there, I would travel (as far as needed) to return! Take it in – you’ll be glad you did AND you’ll return.